Crows are like a lot of other birds in that they regurgitate pellets. If you have a queasy stomach I warn you this might not be an article for you. According to Wikipedia –> The passing of pellets allows a bird to remove indigestible material from its proventriculus, or glandular stomach. In birds of prey, the regurgitation of pellets serves the bird’s health in another way, by “scouring” parts of the digestive tract, including the gullet. 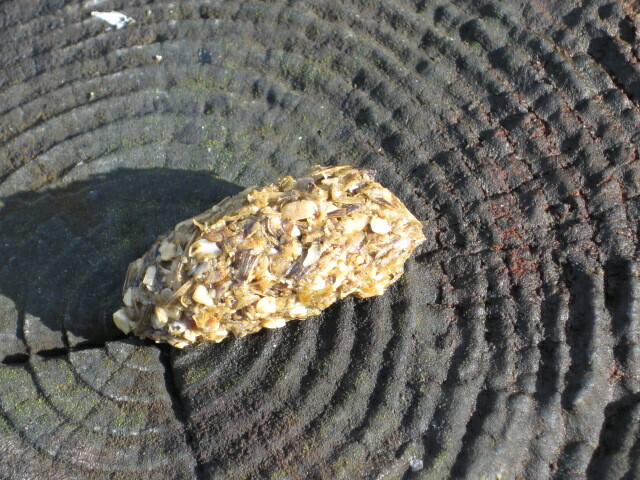 Pellets are formed within six to ten hours of a meal in the bird’s gizzard (muscular stomach). Last week I was down at the beach walking towards the end of the wild area. One of the crows was following me along waiting for the usual bread and peanut hand out. Since he is so unafraid of me, I gave him a couple of peanuts. We got to the end and that was when he landed a few feet from me on an old piling and proceeded to throw up. I was kind of shocked and yet sort of honored that he felt comfortable enough to do his regurgitation in front of me. Being fascinated by this, of course I took a picture for your viewing pleasure. We have so many crows here but I am learning to love them only because of you!